Phytonutrients or phytochemicals are bio-active compounds derived from plants which have dynamic metabolism and act as a nourishing substance. Phytonutrient based plants are being cultivated and used to prevent and treat various forms of human disorders. They are considered crucial for human health, as they aid in altering hormonal balance, enhancing immune system functions, converting beta-carotene to vitamin A, enhancing cell-to-cell communication, repairing DNA damages, and eliminating cancer cells. Phytonutrients also assist as the pigment offering deep hues to plants and foodstuffs. Flavonoids and phenolic compounds offer blue or purple color to blueberries, blackberries, and red cabbages while carotenoids offer yellow-orange color to carrots, papaya, and melon. The market for phytonutrients is primarily driven by the increasing demand for food supplements from food & beverage industry. Phytonutrients are widely used in food & beverages industry as a nutrient additive in bakery products, yogurts, spreads, margarines, sausages, milk, and spicy sauces. Changing lifestyles and food habits among the consumers are expected to boost the demand for phytonutrients products. Vast health benefits of phytonutrients due to their anti-inflammatory, anti-viral, anti-bacterial, and anti-oxidant properties are also encouraging their increased usage. 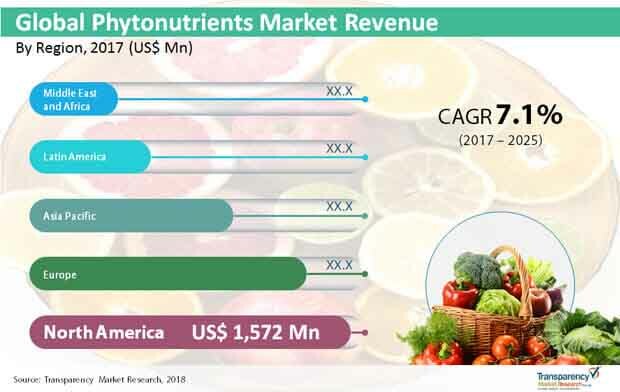 Change in consumption pattern and rise in disposable income of the global consumers is also expected to fuel the growth of phytonutrients market. However, the excessive intake of phytonutrients may have adverse effects on the human body. This factor is projected to hamper the growth of the phytonutrients market. According to the report, the global phytonutrients market will expand at a promising CAGR of 7% over the period between 2017 and 2025. The global phytonutrients market can be primarily segmented into two categories: type and application, apart from region. In terms of type, the phytonutrients market can be classified into carotenoids, flavonoids, phenolic compounds, phytosterols, and others. The majority of the market is occupied by carotenoids and flavonoids on account of their growing demand for food and beauty supplements. Beta-carotene, canthaxanthin, astaxanthin, and annatto are the key carotenoids commercially available across the globe. Carotenoids are used to treat diabetes, cataract, skin damage, and macular degeneration. Whereas, flavonoids exhibit anti-oxidation, coronary heart disease prevention, free-radical scavenging capacity, and potential treatment for anti-human immunodeficiency virus functions. In terms of the application, the global phytonutrients market can be classified into pharmaceutical, food and beverage, personal care & hygiene, animal nutrition, and human nutrition. Food & beverage, by far, occupies the largest share of the global market. Energy drinks and sports drinks contain neutraceutical elements whereas fruits and vegetables are concentrated sources of phytonutrients. The need to include all such nutrients in the balanced diet has led to the increase in demand for food & beverage industry in the phytonutrients market. In terms of region, the global phytonutrients market can be classified into North America, Europe, Asia Pacific, Middle East & Africa, and Latin America. North America accounts for a larger share in the phytonutrients market while Asia Pacific region grows at a faster rate. Conversely, North America and Europe are mature markets with a slow growth rate expected during the forecast period. Whilst, Middle East & Africa and the Latin American regions are emerging markets with higher growth opportunities expected during the forecast period. Prominent players in the global phytonutrients market are Archer Daniels Midland Company, BASF SE, Chr. Hansen, Döhler GmbH, DowDuPont Inc., Kemin Industries, Inc., Koninklijke DSM N.V., Pharmachem Laboratories, LLC, Raisio PLC, and Takasago International Corporation, among others. This report analyzes and forecasts the market for phytonutrients at the global and regional level. The market has been forecast based on revenue (US$ Mn) and Volume (Tons) from 2017 to 2025. The study includes drivers and restraints of the global phytonutrients market. It also covers the impact of these drivers and restraints on demand for phytonutrients during the forecast period. The report also highlights opportunities in the phytonutrients market at the global and regional level. The report comprises a detailed value chain analysis, which provides a comprehensive view of the global phytonutrients market. Porter’s Five Forces model for the phytonutrients market has also been included to help understand the competitive landscape in the market. The study encompasses market attractiveness analysis, wherein end-users are benchmarked based on their market size, growth rate, and general attractiveness. The study provides a decisive view of the global phytonutrients market by segmenting it in terms of type and application. These segments have been analyzed based on present and future trends. Regional segmentation includes the current and forecast demand for phytonutrients in North America, Europe, Asia Pacific, Latin America, and Middle East & Africa. The report also covers demand for individual type, and application segments in all the regions. The study includes profiles of major companies operating in the global phytonutrients market. Key players in the phytonutrients market include Archer Daniels Midland Company, BASF SE, Chr. Hansen, Döhler GmbH, DowDuPont Inc., Kemin Industries, Inc., Koninklijke DSM N.V., Pharmachem Laboratories, LLC, Raisio PLC, and Takasago International Corporation, among others. Market players have been profiled in terms of attributes such as company overview, overall revenue, business strategies, and recent developments. The report provides the estimated market size of phytonutrients for 2016 and forecast for the next eight years. The global market size of phytonutrients has been provided in terms of revenue. Market numbers have been estimated based on type and application segments of phytonutrients market. Market size and forecast for each major type and application have been provided in terms of global and regional markets. Secondary research sources that are typically referred to include, but are not limited to company websites, annual reports, financial reports, broker reports, investor presentations, and SEC filings, internal and external proprietary databases, and relevant patent and regulatory databases, national government documents, statistical databases, and market reports, news articles, press releases, webcasts specific to companies operating in the market, American Chemical Society, International Council of Chemical Associations, 4m Associations, and European Union. Primary research involves e-mail interactions, telephonic interviews, and face-to-face interviews for each market, Type, segment, and sub-segment across geographies. We conduct primary interviews on an ongoing basis with industry participants and commentators in order to validate the data and analysis. Primary interviews provide firsthand information on market size, market trends, growth trends, competitive landscape, and outlook, etc. These help validate and strengthen secondary research findings. These also help develop the analysis team’s expertise and market understanding.